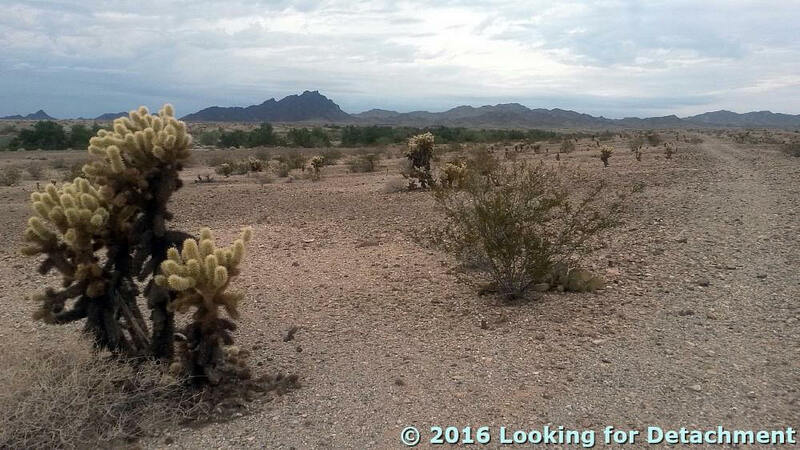 Savahia Peak in the Whipple Mountains, with cholla. And here's a cartoon of the geology. 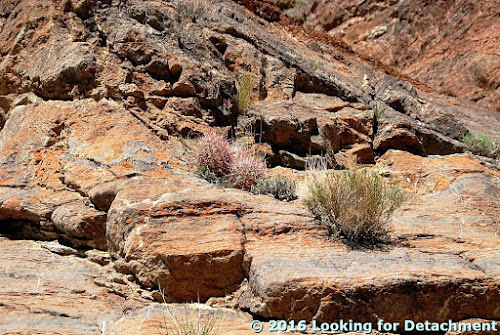 The upper plate volcanic rocks are dipping moderately to steeply to the west (cyan bedding). The Whipple Mountains detachment fault (hachured dark blue) is fairly flat-lying in this area, separating reddish, hematitic upper plate rocks from greenish, lower plate chloritic and mylonitic gneisses. I've drawn in a few approximately located listric normal faults in bright blue to illustrate the general structural configuration. The upper plate has moved to the east relative to the lower plate, as indicated by both the dip of beds in the upper plate, and (especially) by the movement on upper plate listric normal faults. I stopped along the way to check out some run-down and decrepit old buildings in the valley near Twentynine Palms (the valley of Dale Lake, a dry lake or playa, sometimes called "Wonder Valley"), and came upon an area where not only were the mountains being choked and overrun by their own alluvium, they were also being buried by pinkish orange sand blowing in from the western Mojave. 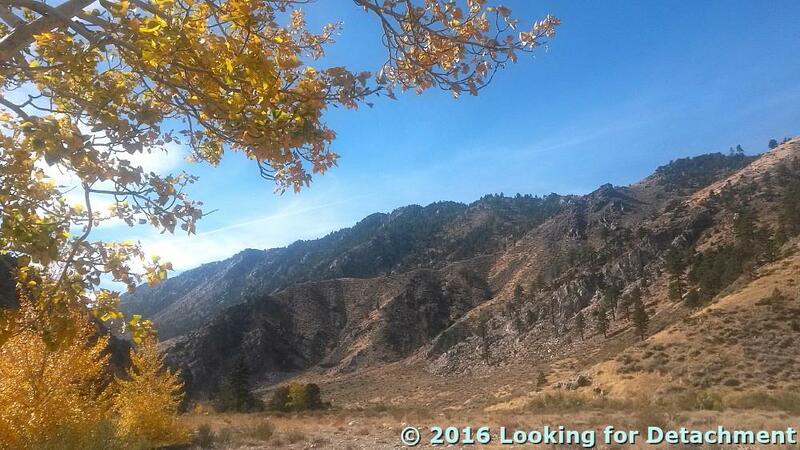 This is the southern Sheep Hole Mountains near the western approach to Clarks Pass. The pinkish orange color is from the abundance of K-feldspar often pink to pale orange in color) in the sand. Here's a quick pic of Mt. Whitney and a little bit of the Alabama Hills. Whitney is the bright rocky peak (or maybe you could just call it a large rock) behind the shadowed mountain, a little left of center. 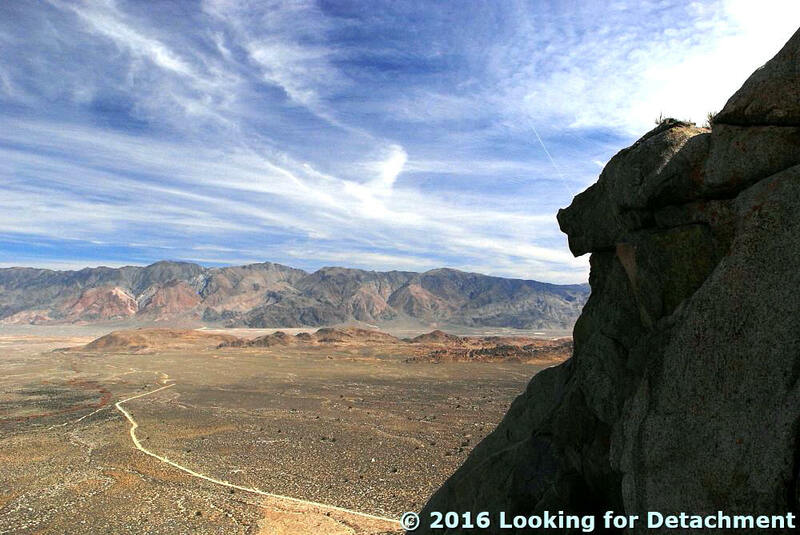 The Alabama Hills are the brown, granitic hills in the middle ground. 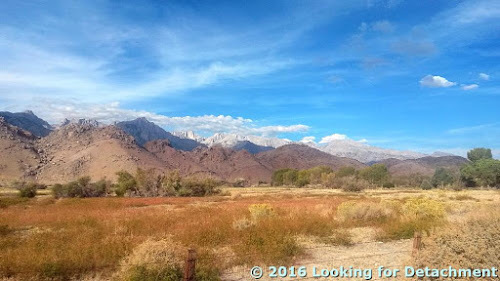 Lots of movies have been shot at least partly in this area (Wikipedia lists some; IMDB lists many, but the list may includes Lone Pine itself). I'm having a little trouble keeping up with the road trip--for one thing, the mobile app thingy doesn't really work very well, so it's easier to just wait until I have wifi, and I don't get any of that when camping (!) --but here are two photos from Conway Summit. The first looks south at Mono Lake. The Sierra Nevada is on the right, and the White Mountains are on the far left (they don't look impressive in this photo, but they are). 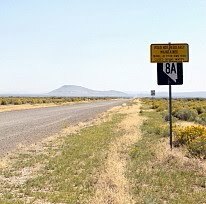 The Mono-Inyo Craters, with the caldera rim of the Long Valley Caldera beyond it (they are indistinguishable in this photo) form the hills that provide a nice backdrop to Mono Lake. You can barely see Paoha Island in this photo; it's the light-colored island behind the dark land mass left of center. The dark land mass is Black Point, a 13,300 year old basaltic cone. Negit Island is easy to see: it's the smallish, dark-colored band to the left of Paoha and Black Point. Paoha and Negit are both volcanic islands, although it looks like the lake is low enough that Negit is not currently an island. The lake looks really low--I thought they were maintaining it at a higher level; maybe it's the drought, maybe the water accord has failed. The roadcut across from the Conway Summit pullout (just below Conway Summit, actually) exposes grusy, unglaciated granite. 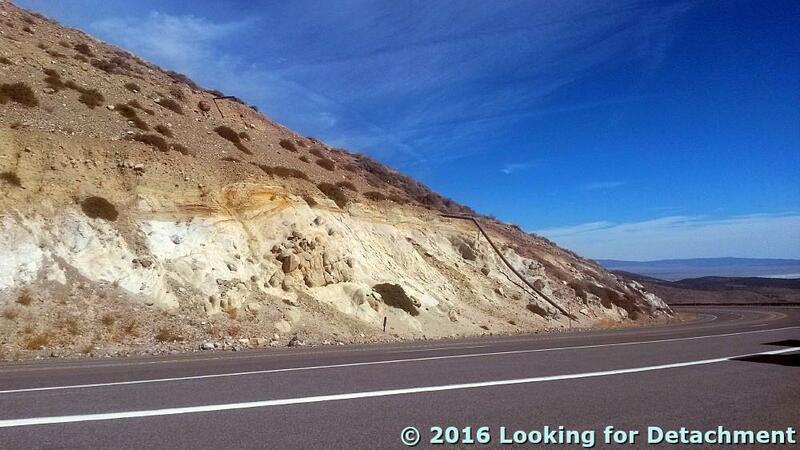 There's also quite an exposure of glacial till in the hill above the granite, and in the hill and roadcut leading up to the summit proper, which you can see when driving north or south on 395. We're looking southwest at mountainous terrain along the West Walker River, with what looks like granitic rock—the light-colored rocks in the foreground and on the tree-covered high slopes in the background—and some dark-colored, mafic-looking rocks exposed in the middle-distance ridge that slopes down toward the river from right to left. These mountains, which are on the west side of Highway 395, are technically part of the Sierra Nevada. A New Road Trip in the Making! Well, I'll be on the road for the next 10 to 14 days, so I'll try to have a couple posts by way of phone photos, provided that I can edit them to get the phone-photo size to match my blog size. It will be an experiment. Photo from Whitney Portal Road looking east toward the White-Into Mountains (taken in early March, 2016). Sierran granite in shadows on the right. 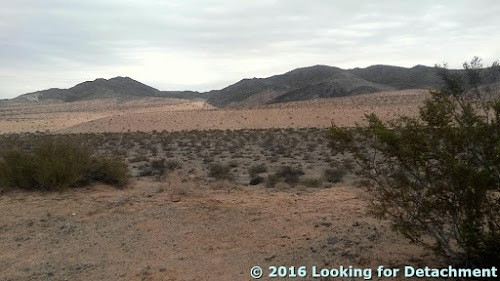 In late February of this year, MOH and I were intent on getting down the Titus Canyon road to see the superbloom in Death Valley, which was going great guns down near Badwater. We nevertheless stopped for a hike not far downstream from the photo in my last post. A few wildflowers bloom in front of an orange-brown outcrop of Carrara Formation limestone. 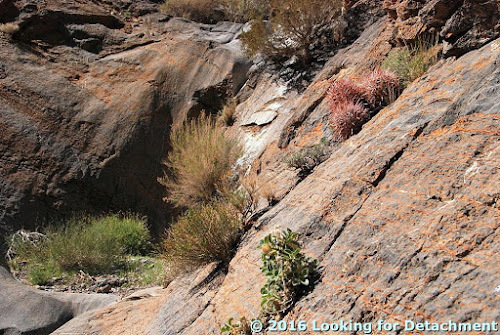 Before hiking some really steep cliffs on the north canyon wall, I looked to the south to grab a few geological photos, not realizing that besides the nice example of dipping beds, I was seeing a good example of one splay of the Titus Canyon fault zone (TCFZ). 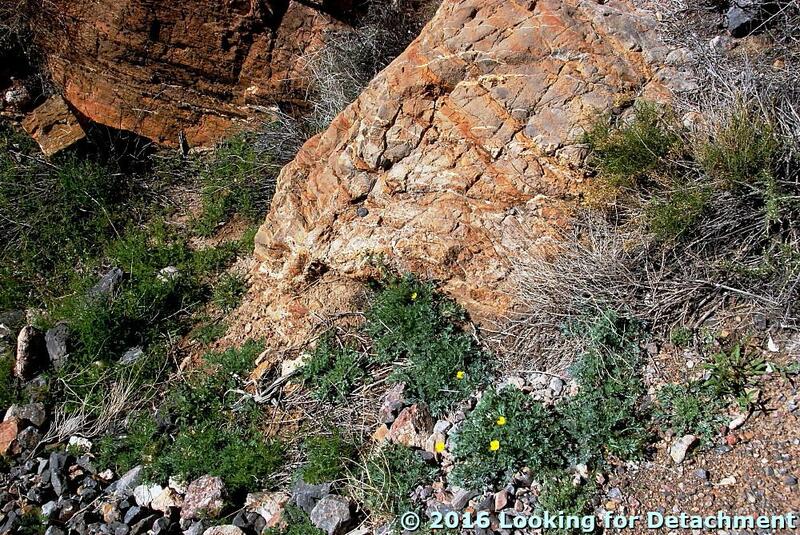 Beds on the south wall of the canyon are dipping in a northerly direction. In the labeled view below, we see the approximate line of one splay of the TCFZ. It has crossed the wash left of the photo (and in front of us in last week’s photo); it goes up, over, and back behind the foreground rocks (the arrow pointing the way); and it eventually wraps around to hook up with the low-angle fault on the more distant, shadowed hill. This interpretation of the location of a main splay of the TCFZ is from Reynolds, as seen in Lengner and Troxel (2008), and is also an extrapolation from Niemi’s 2012 map. A splay of the younger-on-older TCFZ can be seen here in hachured dark blue. 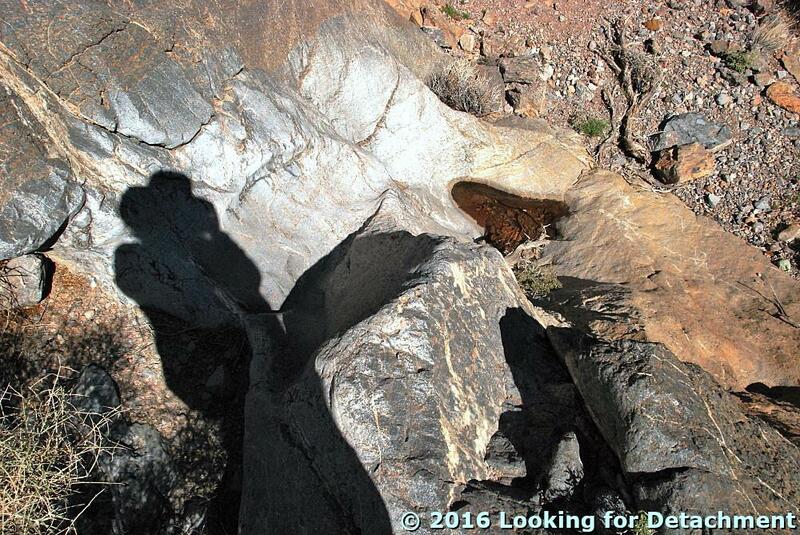 It is placing the younger Bonanza King Formation (Єb) above the older Carrara Formation (Єc) and even older Zabriskie Quartzite (Єz). 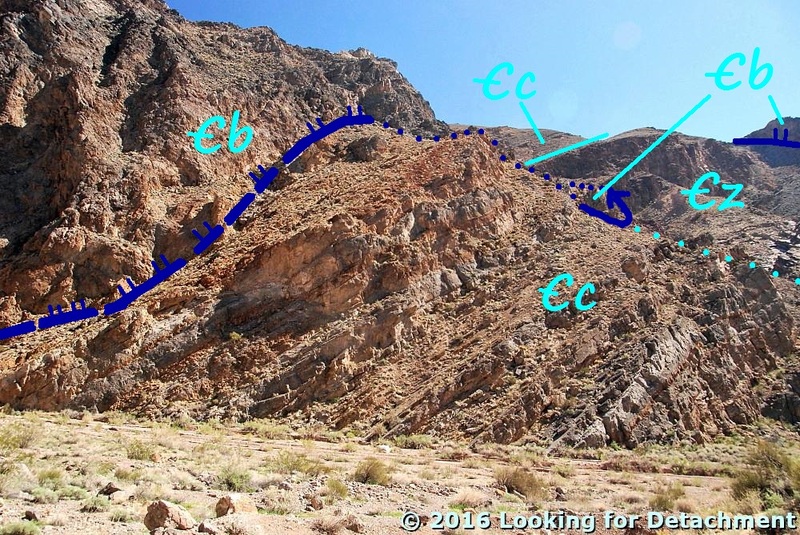 Disclaimers: My placement of the fault is approximate, the foreground part of the fault might be modified by a high-angle normal fault, and the cliff and hills labeled Єz may include some faulted-in Єc. I’ve zoomed in here, just so we can see the fault exposure a little better. The rocks above the nicely bedded section on the right (Єc) look chaotically fractured and possibly brecciated. 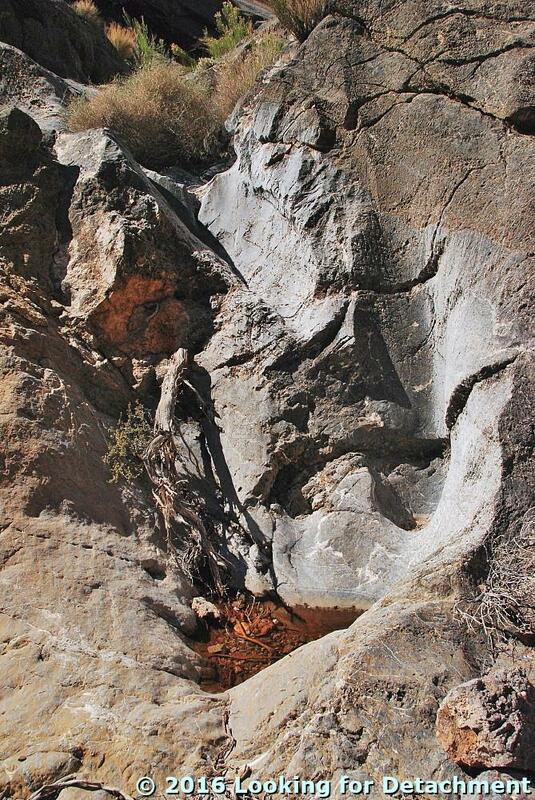 I read somewhere that the Fe-oxide staining of the rocks is typical of the damage zone along the fault. This unpublished map has a mélange unit devoted to certain parts of the TCFZ damage zone. That unit (TfxT; description here) is reported to be particularly pronounced along the westernmost portion of the TCFZ. MOH and I had stopped at this particular point in order to go on a smallish hike—well, we actually stopped to investigate a dry waterfall, and that investigation turned into a scramble (probably Class 3). 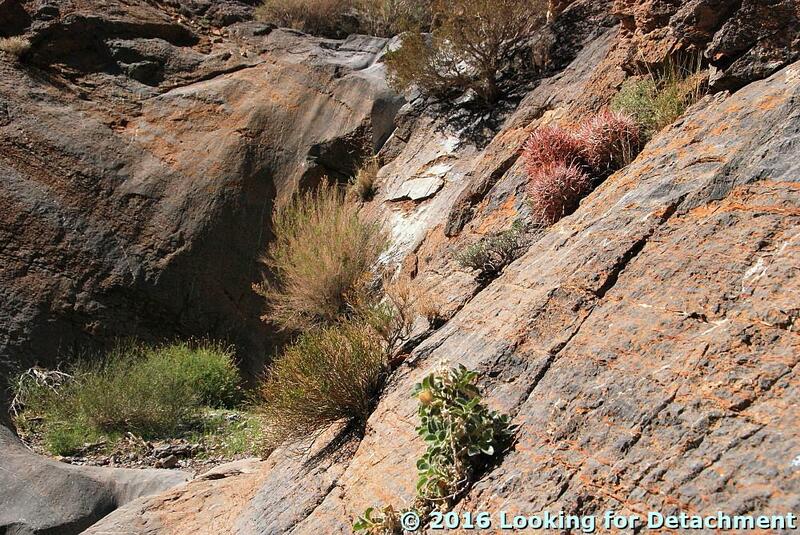 We’re looking up a side drainage on the steep north side of Titus Canyon. The overexposed white areas are limestone that has been scoured and polished by running water and entrained debris. 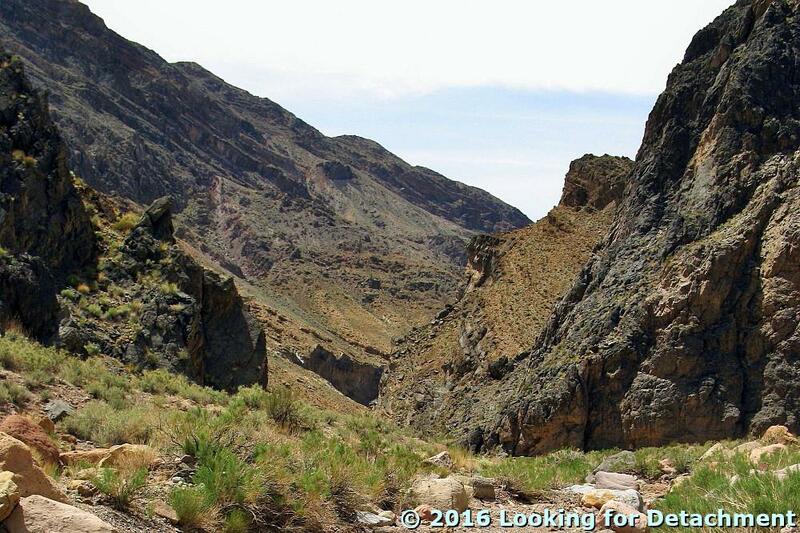 It turns out that this is a decent location to view the Titus Canyon fault. The Titus Canyon fault places the Bonanza King (Єb) over the Carrara (Єc). 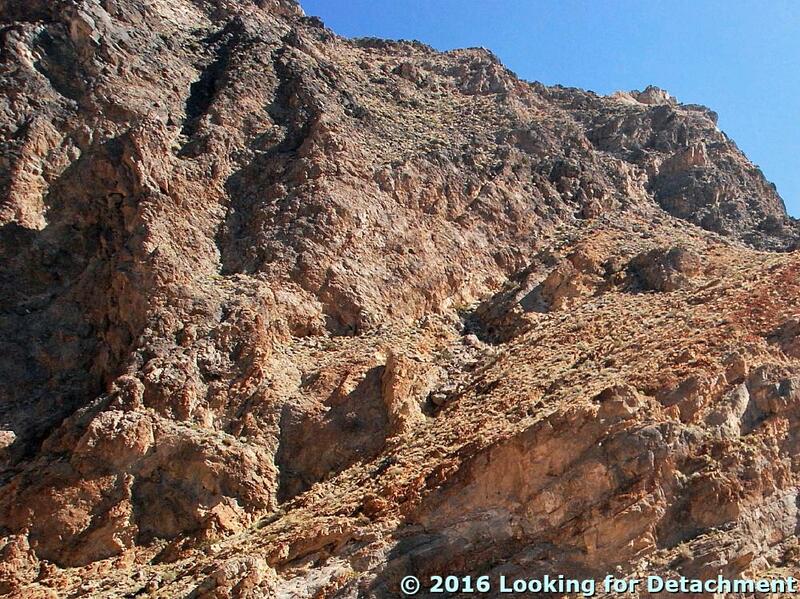 It is mostly (or entirely) behind the lower cliffs on the right side of the photo. 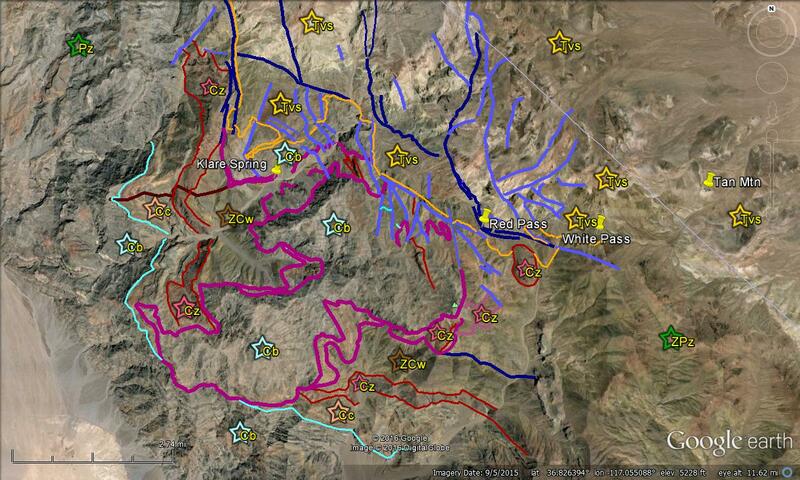 And now, for a little map comparison, before we scramble up the slickrock. A bit of Niemi’s map, from Leadfield to Klare Spring. The UTM grid lines are spaced 1 km (1000 m; 3281 ft) apart. My interpretation of the location of the TCFZ north of the canyon is based largely on a single photo in Lengner and Troxel (2008; their Figure 6.17, p. 114). How do these maps line up? I’ve managed to overlay a transparent version of Niemi’s map on top of the Google Earth image. I’ve corrected a bit of Niemi’s map where I think the labeling and coloring of a portion of Bonanza King Formation (his Єpb, my Єb) and Titus Canyon Formation (EOgtc) was accidentally switched. The overlay is not perfect: The programs I used (Word and Paint) are really not designed for precision. Nevertheless, we see some correlation between the two maps. Interestingly, the place where the two maps show the most divergence is right where Lengner and Troxel have their photo (where my magenta line does a lot of contortions). As far as ground checking of this TCFZ-modified Єb-Єc contact, it’s difficult to impossible to walk up to the fault in most places—at least not without using real climbing techniques or hanging oneself out of a helicopter on a rope! Now we’ll get on with our hike! 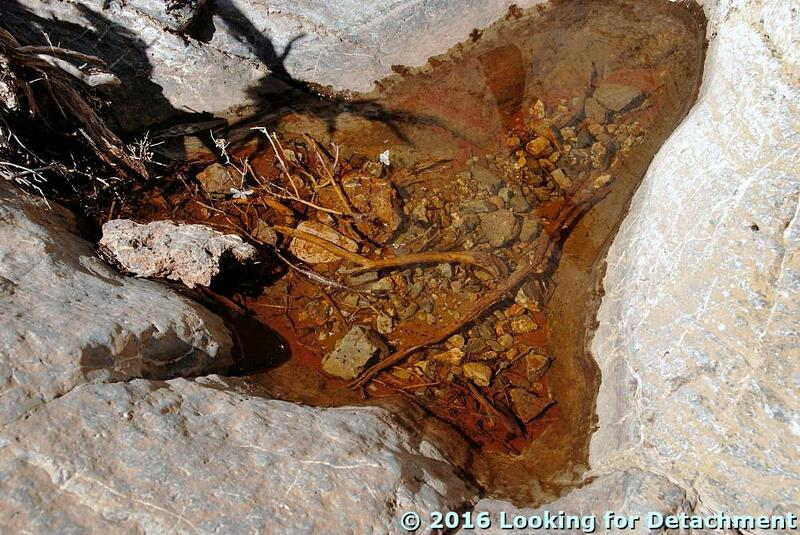 A small pool of water at the base of the lower chute. We've now walked over to the base of the waterfall, where...we find some water! For scale, I offer a fly on the far right. 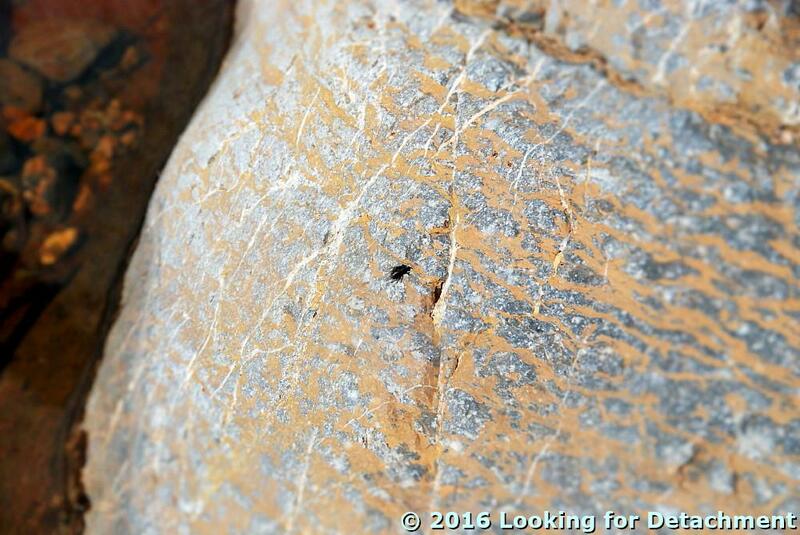 The fly is sunning itself on polished Carrara Formation, which consists here of blue-gray limestone with orange claystone partings and wavy bedding. 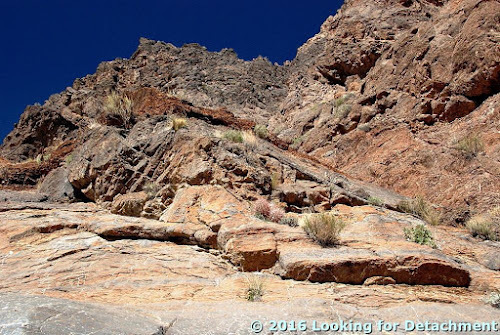 I’ve now scrambled up to a ledge and am looking up the Carrara cliff to the jagged outcrops of Bonanza King Formation (Єb) beyond. The faults drawn in are mostly hidden from view by the jutting lower cliff of Carrara Formation (Єc). The TCFZ, in hachured dark blue, is offset by a high-angle normal fault in lighter blue. I’ve now scrambled even higher, to stand below a second polished chute. The third polished chute, even higher, is above a large, dry plunge pool. This is as high as I got on this dry falls. MOH went up higher, probably to the TCFZ. I didn’t know there was a fault up there, or I might have been tempted to try to climb higher, even though I was about at the edge of my free-climbing competence. I scrambled back down and eventually found myself overlooking the first waterhole. I stand on a ledge above the first pothole. Our next stop will be a little farther downstream, closer to Klare Spring. National Park Service (NPS) Geologic Resources Inventory (GRI) program, 20141114, Unpublished Digital Geologic Map of Death Valley National Park and Vicinity, California and Nevada (NPS, GRD, GRI, DEVA, DEVA digital map) adapted from a U.S. Geological Survey Scientific Investigations Map by Workman, J.B., Menges, C.M., Fridrich, C.J., Thompson, R.A. (2014). Niemi, N.A., 2012, Geologic Map of the Central Grapevine Mountains, Inyo County, California, and Esmeralda and Nye Counties, Nevada: Nevada, Geological Society of America Digital Maps and Charts Series, DMC12, 1:48,000, 28 p. text. Reynolds, M.W., 1969, Stratigraphy and structural geology of the Titus andTitanothere canyons area, Death Valley, California: Berkeley, University of California, Ph.D dissertation, 310 p.
Reynolds, M.W., 1974, Geology of the Grapevine Mountains, Death Valley,California; a summary, in Death Valley region, California and Nevada, Geological Society of America Cordilleran Section, Field Trip 1 Guidebook: Death Valley Publishing Company, Shoshone, California, p. 91-97 [reprinted here]. At the end of our last post—the one about the non-fold—we came into Titus Canyon proper and were looking at this view, down the canyon and to the west. When MOH and I passed through Titus Canyon in May 2009 and February 2016, I didn't know a whole lot about the detailed geology of the canyon: I knew the regional geology of the Death Valley NP, some detailed geology in the Beatty area, and some geologic bits and pieces for the road trip through Nevada, but I didn't know all that much about the geology along the Titus Canyon road. So, although I have some great canyon photos, a lot of the main geologic features in Titus Canyon proper were photographed by accident rather than by design. I've since come to know more of the detailed geology while doing research for the several blog posts comprising this interminably rambling and seemingly unending Titus Canyon series. Not knowing the detailed geology means that over the years I've driven down the road and through the canyon while missing low-angle faults and a huge fold! The photos we'll see during the rest of the trip were not designed with these geologic features in mind, but because geology is everywhere, we can see portions of these features, including exposures of the several low-angle normal faults known collectively as the Titus Canyon fault or fault zone (TCFZ), which crops out in an area of somewhat more than 4 x 5 miles (about 6.5 x 8 km). Source: Modified from part of Fig. 1 of Reynolds (1974), which was reprinted in Troxel and Wright (1976) at NPS History eLibrary. North is not up! The Titus Canyon fault, an enigmatic low-angle structure, places upright Middle Cambrian strata on overturned upper Proterozoic through Middle Cambrian rocks ... . In this instance, upright means right side up rather than overturned or upside down. Like me, Niemi cites Reynolds, both the detailed 1969 version, which I've not seen, and the generalized 1974 version (as in my previous figure). I've seen a version of part of Reynolds' detailed map in Lengner and Troxel (2008); it was particularly helpful in the Leadfield area. 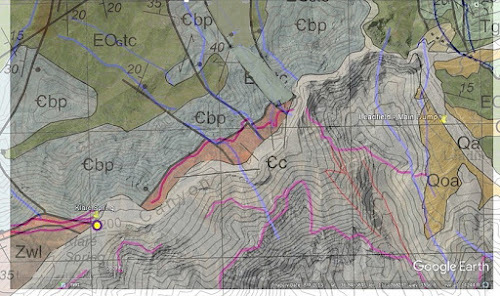 Getting back to the regional map, the main splay of the Titus Canyon fault zone steepens north of Klare Spring to become the high-angle Fall Canyon fault—a single dark purple line trending nearly due north—a fault that cuts rocks at least as young as late Miocene (Niemi, 2012). On the southeast side of the upper plate of the TCFZ, a moderate- to high-angle normal fault—a single dark purple line trending east-southeast—seemingly juts out from beneath the upper plate; it's either cut by the TCFZ or merges with it, I'm not sure which. I think this ESE-trending fault is what's been called the Thimble fault (originally Reynolds, 1969; Saylor, 1991; Niemi, 2002). This fault zone is a distinct boundary in the Grapevine Mountains, separating Cenozoic volcanic and sedimentary strata to the east from Paleozoic miogeoclinal strata to the west [map]. Both the age and amount of displacement on the Fall Canyon fault zone are difficult to determine. The TCFZ (we first saw a bit of it here) consists of one or more low-angle normal faults that were active during mid- to late Tertiary extension of the region (Reynolds, 1974; Saylor, 1991, Niemi, 2002 & 2012). My improvisational interpretation of Reynolds and Niemi on Google Earth—a little bit farther down in this post—is what we'll mostly be seeing in the next several blog posts. Keeping all that in mind, let's get back into the canyon! The first photo with some added geology. 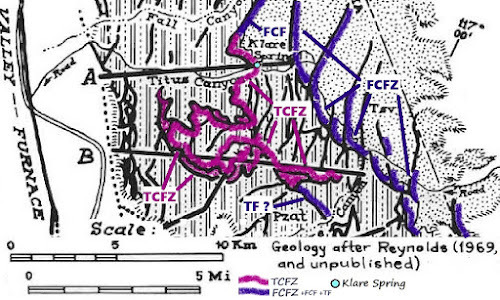 We see a fair example of one of the main splays of the TCFZ in the labeled photo above, over on the right where the Bonanza King Formation (Єb) sits atop Carrara Formation (Єc). 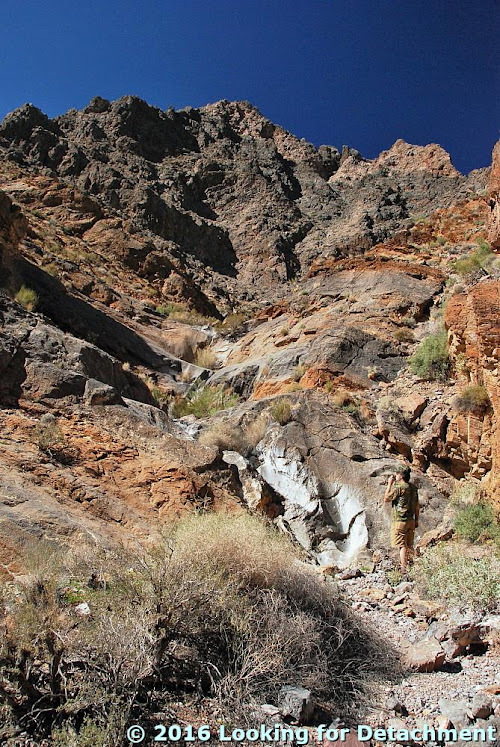 This example of the location of the Titus Canyon low-angle fault is from Lengner and Troxel (2008). I was having a hard time trying to place it from Niemi's map until I noticed their Figure 6.17 on page 114 (I recommend their book if you plan a trip through Titus Canyon). From it's position on the right, the Titus Canyon fault passes in front of us and then to the left, behind the cliffs of Bonanza King. It then wraps around hills we can't see, gets offset once or twice, and becomes (I think) the upper, dark blue fault on the distant slopes. (My correlation of this upper fault with the foreground fault is largely from my interpretation of Reynolds, via Lengner and Troxel, 2008, and my interpretation of Google Earth; this particular fault is not shown on any of the maps I've seen.) I've drawn two splays of the fault system on the background hills. The lower fault as drawn, also not shown on any maps I've seen, partly mirrors Niemi's mapped Єb-on-Єc fault from the north side of the canyon. It's possible that this lower splay doesn't exist. It's also possible that what I've labeled Єb in its upper plate is really Єc, although it doesn't look that way to me (!). My current version of the TCFZ (magenta), the FCFZ and related faults (dark blue), a few other normal faults (blue), the Titus Canyon fold axis (maroon), and several stratigraphic contacts and some formation labels (modified from Reynolds, 1974, Reynolds in Lengner and Troxel, 2008, and Niemi, 2012). As in the earlier geologic map, the low-angle normal faults of the Titus Canyon fault zone (TCFZ) are in magenta; a few possible related faults in the southeast are in dull pink. 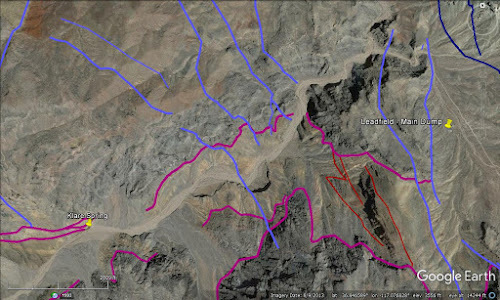 The TCFZ merges into or becomes the Fall Canyon fault (dark blue) north of Titus Canyon, and may do something similar to the southeast (also dark blue). 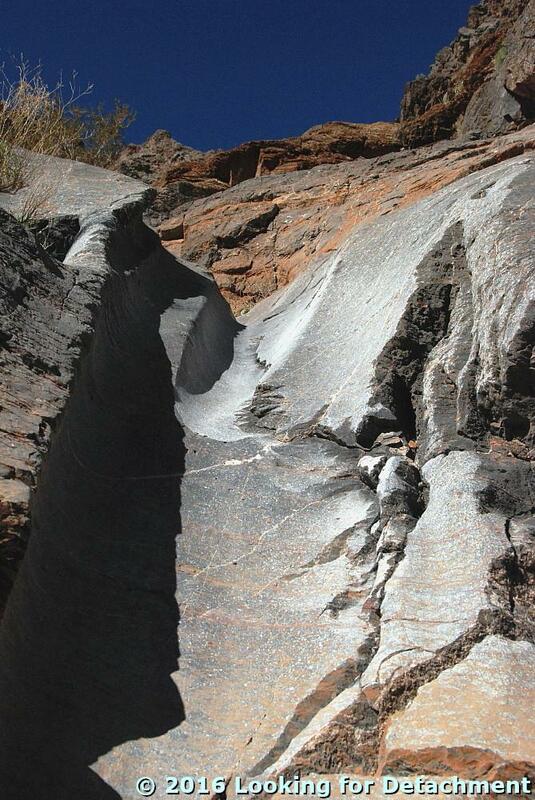 Other faults in dark blue are part of the larger Fall Canyon fault zone (FCFZ), consisting of high to moderate angle normal to oblique faults that flatten at depth. Other normal to oblique extensional faults in are in lighter blue; some of these might be part of the FCFZ. The bigger picture in my GE-cartoon includes the Titus Canyon fold, which we'll see more of later, with it's overturned limb west of Klare Spring. The Precambrian to Cambrian section in that area, from oldest to youngest and east to west, is Wood Canyon Formation (ZЄw) overlain by the Zabriskie Quartzite (Єz), which is outlined on the map in thin maroon lines. Above that is the Carrara Formation (Єc), which is overlain by the Bonanza King Formation (Єb). The Carrara – Bonanza King contact is marked by a thin cyan line; it's mostly seen to the west and south of the TCFZ. I've thrown in a rough demarcation line between the pre-Tertiary and Tertiary section in orange. Not drawn in are bits and pieces of the Titus Canyon Formation lying above the Bonanza King Formation, seemingly and quite possibly in the upper plate of the low-angle TCFZ. Labels on the GE image are listed below. Tvs = Tertiary sedimentary and volcanic formations. Pz = Paleozoic undivided, including some rocks younger than Єambrian. ZPz = Upper Precambrian and Paleozoic undivided, mostly Є and pЄ. I'd hoped to have more photos of the Titus Canyon fault zone in this post, but the geology overcame me! We'll see more next time, when we'll actually, hopefully, go on a little hike. Niemi, N.A., 2002, Extensional Tectonics in the Basin and RangeProvince and the Geology of the GrapevineMountains, Death Valley Region, California andNevada: Pasadena, California Institute of Technology, Ph.D. dissertation, 344 p.
Saylor, B.Z., 1991, The Titus Canyon Formation: Evidence for early Oligocene extension in the Death Valley, area, CA: Cambridge, MIT, M.S. thesis, 54 p.